Odds and ends inspired by Lauren Collins’s piece “Sark Spring: A feudal feud in the Channel Islands” in the New Yorker for 10/29 & 11/5 (pp. 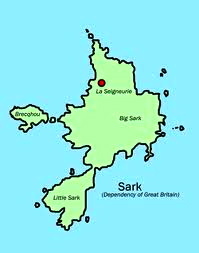 50-61): the demonym for people from Sark; the metrics of Channel Island names; the etymology of Sark; the fury of the Northmen; Scottish sark ‘shirt’; and the whisky Cutty Sark. Sark (French: Sercq; Sercquiais [a local variety of Norman French]: Sèr or Cerq) is a small island in the Channel Islands in southwestern English Channel, off the French coast of Normandy. 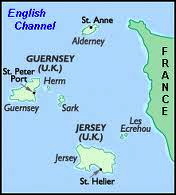 It is a royal fief, geographically located in the Channel Islands in the Bailiwick of Guernsey, with its own set of laws based on Norman law and its own parliament. It has a population of about 600. Sark’s economy depends primarily on tourism. The demonym. Someone from Sark turns out to be called a Sarkee; the word occurs a number of times in the New Yorker article. The plural is Sarkees, a homonym of Sarkese, a fact that suggests that the singular Sarkee originated as a backformation (compare the non-standard Chinee ‘someone from China, a Chinese (person)’). This makes an excellent chant, suitable for fist-pumping public displays (not that I think Channel Islanders would be given to such a thing), or just for a line of trochaic tetrameter that might be worked into some larger form, say a rhyming quatrain (a 4 x 4). Suggestions welcome. The etymology of Sark. This is something of a puzzle. Adrian Room’s Placenames of the World (not an entirely dependable source) treats the etymology as uncertain, but considers the possibility that the name goes back to a Roman name for the island, Caesarea (p. 322). Norsemen is used to refer to the group of people as a whole who spoke what is now called the Old Norse language belonging to the North Germanic branch of Indo-European languages, especially Norwegian, Icelandic, Faroese, Swedish and Danish in their earlier forms. … Norse and Norsemen are applied to the Scandinavian population of the period from the late 8th century to the 11th century. The Old Frankish Nortmann “Northman” was Latinized as Normanni, famously in the prayer A furore normannorum libera nos domine (“From the fury of the Northmen release us, O Lord!”), attributed to monks of the English monasteries plundered by Viking raids in the 8th and 9th centuries, and entered Old French as Normands, whence the name of the Normans and of Normandy, which was settled by Norsemen in the 10th century. Whether Sark is Norman French or earlier Germanic Norman, there is the question of what it meant, and that’s still unclear. The fury of the Northmen. I recall this prayer as being in an edition of the (Anglican) Book of Common Prayer that I used at some point in my earlier life (though I remember it as warning of the fury of the Norsemen) and being enchanted by the idea of praying to ward off Viking invaders. It’s no longer in the BCP I have. Sc. and north. (and occas. arch.). A garment worn next the skin; a shirt or chemise; occas. a nightshirt; also transf. a surplice. In Scottish still the ordinary word for ‘shirt’. If this noun is in any way related to the placename Sark, there’s a lot of historical detail to be unearthed. So a cutty sark would have been the 18th-century analogue of the modern scrimmage t-shirt or cropped scrimmage shirt (for guys) or half t-shirt or midriff t-shirt (for girls) (see here). The semantic development was then from the (semantically transparent) name of a type of clothing to the nickname of a fictional character to the proper name of a ship to the name of a brand of whisky. Sometimes an actual history outstrips any ingenious story you might concoct. This entry was posted on November 2, 2012 at 10:05 am and is filed under Back formation, Etymology, Names, Poetic form. You can follow any responses to this entry through the RSS 2.0 feed. You can leave a response, or trackback from your own site. But the name “Herm” leads to so many good name-origin stories. The easy one is that they couldn’t decide whether it was a boy-island or a girl-island, so it must be a herm(aphoriditic) island. But I think that someone pointed to it and asked a local its name, to which s/he replied, “Hmmmmm…”, and the rest is history. I learned to sing the tune from a medical school classmate (now a psychiatrist). coft: bought (see German kauften). But what’s a bleerie? We’re very well saired, Janet, quoth Duncan Macleerie. Weel done, my Duncan, quoth Janet Macleerie. Play us a pibroch, quoth Janet Macleerie. Very weel danced, Janet, quoth Duncan Macleerie. To “Sarkee” and “Chinee” add “Portagee”; there’s a section of Gloucester, MA, known (at least informally) as Portagee Hill. The whiskey named after a ship, etc., reminds me of Cambridge, MA’s Alewife, a subway station named after a road named after a brook named after a fish named after a landlady. The Channel Islands make their mark.